Shop for authentic Hong Kong (Xianggang) Flags. We offer indoor and outdoor Hong Kong (Xianggang) flags in durable nylon. Our outdoor flags are finished with a canvas heading, while indoor flags are finished with a lined pole hem and your choice of with or without fringe. 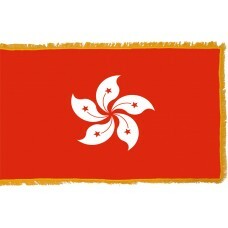 We also offer indoor and outdoor Hong Kong (Xianggang) flag sets. 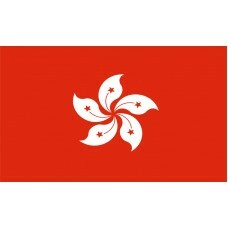 The flag of Hong Kong was developed and approved in 1990 in preparation for when the former British Colony would become a Special Administrative Region of China in 1997. It was first officially hoisted at midnight on July 1st, 1997 when the colony was formally handed over to the Chinese. The flag is comprised of a solid red background, which was chosen to mirror the red of the People's Republic of China flag and because red is celebratory in Chinese culture. There is a white stylized Bahunia flower set in the middle. This flower is native to Hong Kong although it is normally pink in color. On each petal is a red star, again to tie in with the five stars on the flag of China. The flag was created to encompass the principal of China and Hong Kong coming together as one country but under two systems. Hong Kong is a place that is all about contrasts and perhaps where the Chinese philosophy of Ying and Yang is most apparent. This philosophy of contrasting elements combining to make a greater whole can be found everywhere in Hong Kong. This former small British colony located off the south-east coast of China started out as a poor rural fishing village but grew to become an internationally important trade and financial hub. This is mainly due to is location on the old trading routes and being able to combine the best of both worlds. The contrasts start with the vast skyscrapers, busy streets, large high-rise housing estates, and an extensive transport system. It is known to have the largest proportion of skyscrapers in the world with over 7000 buildings having more than 14 floors in comparison; New York only has about half that number. With a population of around 7 million and a small land mass, the only way to house so many people is with large high-rise housing estates and modern apartment blocks. If you go out to one of the many outlying islands you will find shacks and wooden houses whose style and structure has altered little from when the area was dependent on farming and fishing. The most efficient way of getting so many people around is a transport system that is fully integrated and includes underground trains, buses, trams, and ferries. Within this very efficient system you also find contrasts as it utilizes the ultra-modern underground system built in the 1980s with the famous star ferries and trams that have been in use since the turn of the 19th century. In among all of this commercialization and modernity you will find very strong elements of tradition. Residents have a small shrine in their apartment to offer prayers to their Gods and place offerings on them or make use of the many temples tucked in among the skyscrapers. Tai Chi is performed in any open space, big or small and both the Chinese and Western festivals are observed and celebrated throughout the country. As with the country itself, the flag of Hong Kong has found a way of combining old and new.